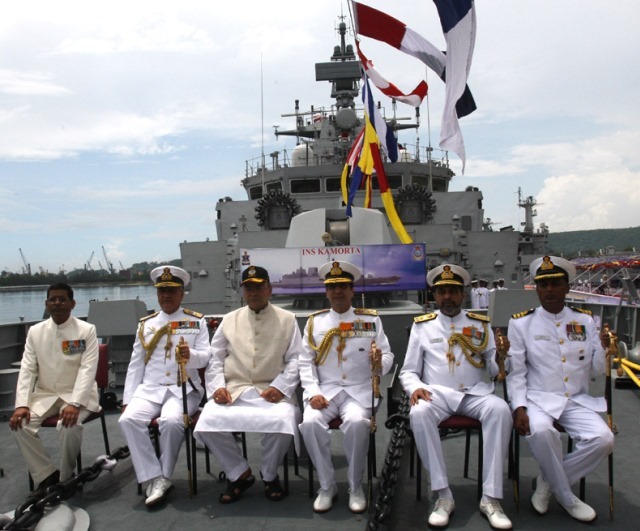 Union Minister Arun Jaitley along with the Chief of Naval Staff, Admiral R.K. Dhowan among other onboard INS Kamorta at Eastern Naval Command, Visakhapatnam on August 23, 2014. The Indian Navy celebrated the World Environment Day in style and adopted several green initiatives under the guidance of Admiral R.K. Dhowan, Chief of the Naval Staff. The Green Initiatives Programme of the Indian Navy is another feather in its admirable cap. Embracing energy efficiency and environment consciousness the Indian Navy, which is an energy intensive force with considerable energy and environment footprint, has synergised its efforts towards achieving a green footprint. This is being done through developing a comprehensive “Indian Navy Environment Conservation Roadmap” which will be an addition to the Navy’s blue water capability. Over the course of the last year, the Indian Navy has formulated numerous policies aimed at reduction of energy consumption and environment sustenance and these have been disseminated to all ships, as well as shore establishments. With the Energy and Environment policy firmly in place, the Navy has now set itself targets to minimise consumption of various commodities it utilises. These targets are planned to be achieved without any compromise to the primary operational role of defending our sea-board frontiers. The philosophy of energy and environment sustainability is becoming a way of life in Naval Operations, Maintenance and Community Living. A Green Energy Cell has also been constituted at Navy Headquarters (NHQ) to oversee and co-ordinate pan Navy implementation of these initiatives. Guidelines for energy efficient operations at sea, compliance to MARPOL guidelines for emission control, waste disposal, discharge of onboard fluids, use of environment friendly Sewage Treatment Plants, toilets etc are some of the measures adopted to reduce the environment footprint of naval platforms. Widespread afforestation drives, increasing use of renewable energy, adoption of the 4R (Reduce, Replace, Reuse and Recycle) concept, commissioning of Effluent Treatment Plants and biogas plants in shore establishments have also been initiated. Regular cleanship drives are also undertaken as part of the “Swachh Bharat Abhiyaan” and all Naval personnel, including the civilian work force have administered the “Swachhta Shapath”. Leveraging technology for automation in office work, at least one naval establishment has achieved a 30 per cent reduction in the use of paper. The Navy has now set upon itself a goal of 10 per cent reduction of paper consumption in all its establishments this year. Similarly, with the use of energy efficient electrical appliances, increased usage of renewable energy sources such as wind and solar and sensitisation of its large workforce, 10 per cent reduction in daily power consumption was achieved, which is now planned to be translated to a 3-5 per cent reduction in overall annual power consumption. Afforestation is also actively being pursued at various places. The effort at Vishakhapatnam at the Eastern Naval Command, which endured the cyclone Hudhud is particularly laudable, with over 40,000 saplings having been planted. Resurrection of close to 150 full grown trees which had fallen, including six Banyan trees with trunk diameters of over one metre each, has also been successfully executed. Being a maritime force, the Navy is at home in water. It is thus not surprising that Marine Renewable Energy sources like Ocean Thermal Energy Conversion (OTEC) and Tidal energy are being examined for electric power generation. Their application is expected to augment, or even replace the present energy sources in certain coastal areas. Trials of fuels based on bio-extracts are also underway. Although a lot has been achieved in the past one year, the Navy is relentlessly pursuing the energy and environment goals planned by the Government to ensure a greener and cleaner tomorrow. The Green Initiatives Programme would aid in boosting the national interests of environment sustainability and self reliance in energy. In addition to the existing military, diplomatic, constabulary and benign roles envisioned in the Indian Navy’s Maritime Doctrine which define the objectives of its operations, the Indian Navy has now added social and environmental responsibility as essential doctrines in its working. This makes it one of the most responsible Naval force in the entire world!